Our vision is to lead the way in dementia care in Ireland through innovation, education and community engagement. Developing best practices that others can replicate, where families, staff, volunteers and communities are supported, engaged, and empowered to ensure that people living with dementia enjoy the Quality of Life they deserve. 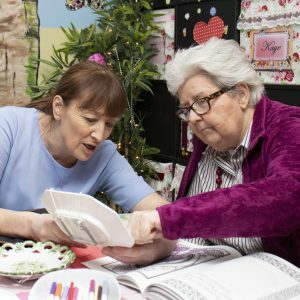 Our mission is to provide dementia specific person centred care, focussing on the social, emotional, psychological and physical needs of people at all stages of dementia, in a real home environment, where their feelings matter most. In 1955, Kilcroney House Hotel and Country Club was bought from Sir Basil Goulding by the Hospitaller Order of Saint John of God and re-named Saint Joseph’s. At first, the house was a Juniorate Collge for boys wishing to become Brothers. In 1961 guests and elderly gentlemen were introduced – the purpose being to give the young aspirants to the Order some idea of their future apostolate with the sick. In 1976, part of the Ballroom was converted to allow for nine additional beds, making a total of 32 beds in the Nursing home. The first female patient was also admitted in 1976. In 1977 the Juniorate College closed. In response to growing needs of older people being cared for at home, Crinken House Day Care opened in 1989. Initially it supported isolated older people but eventually included those with early onset dementia. The suitability of the facilities at Kilcroney to support older people with greater dependency became an issue and in 1994 a new nursing home was built in the grounds of Crinken House, Shankill, Co Dublin. This was designed as a single storey general purpose nursing home. However, in keeping with the ethos of the Hospitaller Order of Saint John of God to identify and respond to unmet needs, the Centre began to admit older people suffering from dementia related illnesses. Today, Saint Joseph’s Centre is now known as Saint Joseph’s Shankill and is home to 60 people and offers 2 people a respite bed every week with 120 Day Centre places.